It's often difficult to know what to do in a hailstorm. A hailstorm will often come out of nowhere and can cause considerable damage to cars and buildings. Hail forms when frozen water droplets or small clumps of ice are thrown around in thunderstorms and accumulate more layers of ice until they grow anywhere from the size of a pebble to the size of a baseball! 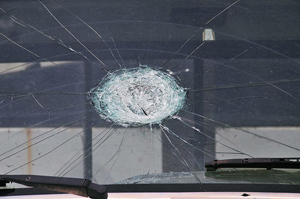 As you might imagine, flying balls of ice tend to do some damage when they hit vehicles and buildings. There are, however, a number of ways you can avoid damage to your property. Today, the Insurance Experts will take on hail! As with many things in life, preparation can save you a great deal of time. Keep up-to-date on the weather by listening to the radio, watching the weather report on TV, checking the weather online, or following up-to-the-second Twitter updates on weather in your area. You can also learn how to recognize the weather conditions that tend to precede hailstorms. If a hailstorm is coming, or it starts to hail out of nowhere, move cars, boats, RVs, and outdoor furniture into a garage or covered structure of some kind. Hail can do serious damage to your car's body, potentially costing you thousands of dollars in repairs. If thunderstorms are predicted in your area, keep your vehicles inside the garage rather than out on the street or in the driveway. Replacing shingles can be incredibly expensive. If you live in a region that has a high risk of hailstorms, consider investing in impact resistant shingles or metal roofing which can handle a high level of hail damage. You may even get a discount on your insurance premiums for making such an investment. In the event that you can't protect your property, for one reason or another, consider investing in hail insurance for your home. Check any existing policies to see if you're covered and if you aren't, talk to your insurance broker about including it.